If I have a profile for the wrestler on the website, you can click on their name above to go straight to it. 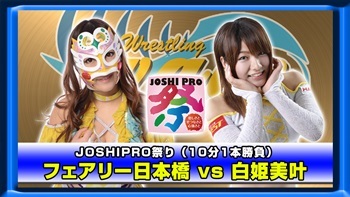 Lots of Joshi to watch, and it is worth noting that all matches have a ten minute time limit for this event. Pro Wrestling WAVE starts with a bang, as their Ace takes on one of the hottest Freelancers on the scene. Ryo won the Regina di WAVE Championship from Yamagata on December 29th, 2016 and has held it ever since, with two successful defenses. Coming into the match, Hiroyo held the OZ Academy Openweight Championship and the Goddesses of Stardom Championship, so this is a rare champion vs. champion singles encounter. The two champions tie-up to start, Hiroyo pushes Ryo into the ropes but she gives a mostly clean break. Waistlock by Ryo as they trade holds, they end up on the mat but quickly reach a stalemate as they return to their feet. They get into a Test of Strength, Ryo goes off the ropes and she shoulderblocks Hiroyo to the mat. Shoulder tackles by Ryo in the corner and she hits a lariat, she picks up Hiroyo but Hiroyo slides away and throws Ryo into the corner. Hiroyo puts Ryo across the second rope and hits a body avalanche, reverse double knee by Hiroyo and she covers Ryo for a two count. Hiroyo waits for Ryo to get up but Ryo blocks the lariat attempt and hits a running leg lariat, she picks up Hiroyo and hits a powerslam for a two. Anaconda Vice by Ryo, but Hiroyo reverses the hold and applies a keylock. Ryo gets into the ropes to force the break, they both go for lariats but neither wrestler goes down. Body Block by Hiroyo but Ryo sends her to the mat with a lariat, she waits for Hiroyo to get up and hits a second one, dragon suplex hold by Ryo but Hiroyo barely kicks out. Ryo picks up Hiroyo but Hiroyo slides away, she goes for a powerbomb but Ryo back bodydrops out of it. Ryo charges Hiroyo but Hiroyo hits a lariat, she goes for the backdrop suplex but Ryo blocks it. Hiroyo trips Ryo and hits a deadlift German, sliding lariat by Hiroyo but the cover only gets a two. Hiroyo picks up Ryo and hits a lariat, backdrop suplex by Hiroyo but Ryo gets a hand on the bottom rope to break up the pin. Hiroyo picks up Ryo but Ryo snaps off a dragon suplex, lariat by Ryo but the bell rings as she goes for the cover. The match is a Draw. This is a “48 Count” Match. What does that mean, you ask? Well that means that if neither is able to get the win by a traditional method, the winner of the match will be whomever has the cover the 48th time that the referee makes a count. For example, if every cover gets two counts, then on the 24th cover, the wrestler doing the cover would get the win on the 2nd count as that would be the 48th time the referee’s hand hit the mat cumulatively. Its as goofy as it sounds. Also, both are wearing schoolgirl outfits, because Japan. Cherry is here from DDT, she is a long time veteran, while Yukihi is a younger wrestler from Ice Ribbon. I’m not going to count down the “48 counts” but I’ll let you know when we are getting close. Maya hits the first move of the match with a dropkick, headlock by Cherry and she shoulderblocks Maya to the mat. Cherry comes back with an armdrag and the they trips/quick counts before returning to their feet. Cherry grabs Maya by the hair and throws her into the corner, running elbow by Cherry and she hits a face crusher for a two count. Dropkick by Cherry but Maya hits a STO, running boot to the head by Maya and she covers Cherry for two. Bodyscissors by Maya and she rolls Cherry around the ring, occasionally stopping to get two count covers. Superkick by Maya, but Cherry barely gets a shoulder up on the cover. Maya goes up top but Cherry avoids the senton bomb, she rolls up Maya but Maya reverses it as the two trade flash pin attempts. Maya goes off the ropes and they both go for a backslide, Cherry gets it applied but it only gets two. A Northern Lights Suplex by Cherry gets a two count, she goes off the ropes but Maya cuts her off and connects with a series of kicks for a two count. Maya picks up Cherry but Cherry blocks the scoop slam, jumping lariat by Cherry and she puts Maya in a cross armbreaker. Maya gets out of it and goes off the ropes, but Cherry uses the referee to help her hit a lariat. She then throws the referee on top of Maya and hits a footstomp, cover by Cherry and the reluctant referee counts two. That puts us at 47 counts! Double chop by Cherry but Maya kicks out of the pin before the one count, superkick by Maya but Cherry kicks out before the one as well. Maya goes off the ropes but Cherry avoids the lariat attempt and trips her. Spring Night Love by Cherry, and the bell rings as soon as the referee counts to one since that is 48 counts! Cherry wins! I’m not sure if under the best case scenario that Cherry and Maya could have a great match together, but they certainly couldn’t in these conditions. The 48 Count thing isn’t offensive but it was the focus of the match as both were going for a lot more covers than usual since they had to get a high count number before the match became a Draw, otherwise the gimmick would have been meaningless. The schoolgirl outfits were fine but also was a focus at times instead of the actual wrestling. For an undercard match there was nothing horribly wrong with it, the action was just lackluster and the gimmicks didn’t enhance the match. We are back to a more normal match, as popular Freelancer Kagetsu takes on young K-DOJO wrestler ERINA. ERINA just debuted in November and rarely ventures outside of K-DOJO, in fact this is her first-ever match outside the K-DOJO umbrella. Kagetsu wrestles mostly in OZ Academy and Stardom and is an eight year veteran so its a bit of a mismatch, but hopefully Kagetsu can get a quality match out of the rookie. ERINA dropkicks Kagetsu as the match starts, she goes for a crossbody but Kagetsu catches her and slams ERINA to the mat. Dropkick by Kagetsu and she snapmares ERINA a few times before applying a camel clutch, but ERINA gets a hand onto the ropes. Hard elbow by Kagetsu and she scoop slams ERINA, another slam by Kagetsu and she covers ERINA for two. Kagetsu goes back to the half camel clutch but ERINA gets to the ropes again, dropkick by Kagetsu and she puts ERINA into a hammerlock. Cross arm submission by Kagetsu but ERINA gets a toe on the ropes, Kagetsu puts ERINA in the ropes and stretches the rookie. Kicks by Kagetsu and she dropkicks ERINA in the back for a two count cover. Kagetsu picks up ERINA but ERINA jumps up onto Kagetsu and hits a DDT. Jumping crossbodies by ERINA and she kicks Kagetsu back before hitting a tornado DDT out of the corner. ERINA gets on the second turnbuckle and hits a diving crossbody, but Kagetsu kicks out of the cover. Kagetsu picks up ERINA but ERINA elbows her off, running elbow by Kagetsu and she delivers a PK for two. Kagetsu picks up ERINA but ERINA sneaks in an inside cradle, she tries a couple more flash pins but neither gets the pinfall. ERINA goes off the ropes but Kagetsu kicks her in the stomach and hits a vertical suplex. Cross armbreaker by Kagetsu in the middle of the ring, and ERINA has no choice but to submit! Kagetsu is the winner. This was a very “rookie opener” style of match as it was a little rough and not a lot of note happened. ERINA got in her spots so it was far from a squash, but Kagetsu was firmly in control. There were a few clunky transitions, likely just due to ERINA’s inexperience (especially wrestling outside of K-DOJO), and the ending was really sudden with no setup. Not a great match, but hopefully ERINA learned a thing or two that she’ll use as she moves forward in her career. Another interesting match. Age-wise, this is a very even match, as both wrestlers are 21 years old. Hiroe started slow in WAVE but has grown a lot in the last year, no big signature wins yet but she has been progressing nicely. Natsumi is from Actress girl’Z, she used to wrestle in Stardom quite a bit but hasn’t been seen there so far this year. She has been wrestling in lots of other promotions however, and she still appears to be as spunky as ever. They tie-up to start, Natsumi pushes Hiroe into the ropes and hits a few elbows but Hiroe fires back with a lariat. Hiroe goes for a snapmare but Natsumi cartwheels out of it and hits a dropkick. Irish whip by Natsumi but Hiroe reverses it and hits a dropkick, another dropkick by Hiroe and she covers Natsumi for two. Natsumi goes off the ropes, she cartwheels off of Hiroe and hits an armdrag. Dropkick by Natsumi and she hits two more, Natsumi goes up top and she hits a diving crossbody for a two count. Natsumi picks up Hiroe and goes off the ropes, but Hiroe delivers a running elbow. Hiroe picks up Natsumi and elbows her into the corner, rebound crossbody by Hiroe and she gets a two count. Elbows by Hiroe but Natsumi dropkicks her, back kick by Natsumi and she nails the cyclone suplex with a bridge but Hiroe barely gets a shoulder up. Elbows by Natsumi but Hiroe elbows her back and hits a dropkick, Natsumi goes off the ropes but Hiroe hits a Northern Lights Suplex for two. Vertical suplex by Hiroe and she hits the Sakura Otoshi for the three count! Hiroe Nagahama is your winner. A pretty simple match, but not a bad one. Natsumi was on point here, sometimes she isn’t completely smooth but she hit everything well and seems to be improving. Hiroe is solid, nothing that really lights up the room but fundamentally sound. Short and to the point, but with some bright spots. Perhaps the biggest test of young Mika’s career, as she takes on Fairy Nipponbashi. Mika hails from Sendai Girls’, she debuted in late 2015 but still is having trouble working her way up the card as she was quickly left in the dust by fellow graduate Chihiro Hashimoto. Nipponbashi is WAVE’s primary comedy wrestler, as her name implies she is a fairy with a magic wand that does magic things. It isn’t my personal favorite brand of comedy but it is generally inoffensive. Nipponbashi dances around the ring, but Mika has none of it and kicks her to the mat. Crab hold by Mika, but Nipponbashi makes it to the ropes. Mika elbows Nipponbashi into the corner but Nipponbashi gets her wand and hits Mika in the knee with it. Face crusher by Nipponbashi, she tries to toss Mika with the magic of her wand but Mika doesn’t budge. Nipponbashi tosses the referee to show Mika what she is supposed to do, but Mika still isn’t impacted by the wand. Nipponbashi throws the referee again with the magical wand, and finally Nipponbashi is able to send Mika across the ring by the wand. Mika gets up, Nipponbashi gives her the wand to try but nothing happens when she tries to use it and Nipponbashi laughs at her. Mika kicks Nipponbashi a few times in retaliation, vertical suplex by Mika and she gets a two count. Mika goes up top but Nipponbashi puts her hands up and talks Mika down fro the turnbuckle. Nipponbashi lies back down, Mika goes up top again but Nipponbashi avoids her dive and rolls up Mika for two. Inside Cradle by Nipponbashi and a backslide, but those both gets a two count as well. Mika picks up Nipponbashi and hits a Northern Lights Suplex Hold, but Nipponbashi gets a shoulder up. Mika picks up Nipponbashi and hits a superkick, rounded roundhouse kick by Mika and she gets the three count! Mika Shirahime is the winner! The issue with Nipponbashi is her matches are all pretty much the same, so once you’ve seen the shtick the only amusement is how her opponent plays along. Its more funny when it is someone like Aja Kong, but while Mika played the part fine it wasn’t anything special. A skippable match, not my cup of tea. A rare look at LLPW-X affiliated wrestler SAKI! SAKI doesn’t have an incredibly active wrestling schedule and doesn’t make TV very often, she is a four year veteran but has never won any titles in her career. Sareee is a 20 year old wrestler now affiliated with SEAdLINNNG, she is a fantastic young wrestler that only gets better every time I see her. Not sure what to expect from this but I’m sure it will be fun. SAKI charges Sareee right as the bell starts, Sareee avoids her and goes for a quick schoolboy but SAKI rolls through it and kicks Sareee in the face. Sareee bridges out of the pin attempt and hits three dropkicks, she picks up SAKI but SAKI puts her in a stretch hold. SAKI tosses Sareee down by the hair but Sareee returns the favor, Irish whip by Sareee but SAKI hits a shoulderblock. Two more shoulderblocks by SAKI, and she covers Sareee for two. Sareee comes back with a dropkick but SAKI hits a face crusher, single leg crab hold by SAKI but Sareee gets into the ropes. SAKI puts Sareee in a suspension submission hold, she lets her go and goes for a suplex, but Sareee blocks it. SAKI goes off the ropes but Sareee rolls her up and hits a footstomp to SAKI’s stomach. Dropkick by Sareee while SAKI is against the ropes, fisherman suplex hold by Sareee but SAKI kicks out at two. Sareee goes up top and hits a missile dropkick, another missile dropkick by Sareee and she covers SAKI for two. Sareee goes up top again but this time SAKI recovers and tosses Sareee off the turnbuckle, SAKI then gets on the second rope and hits a Reverse Splash for a two count. Back up they trade elbows, Sareee gets the better of it but SAKI catches her with a vertical suplex. SAKI goes for a pump-handle slam but Sareee reverses it into an inside cradle for two, SAKI boots Sareee in the head but she gets a two count as well. SAKI goes for a lariat but Sareee ducks it and hits a German suplex hold, Sareee quickly picks up SAKI and nails the Sareee Special Suplex Hold for the three count! Sareee wins! There is a significant skill-level difference here, but an interesting match nonetheless. Rin is a rookie in Marvelous, which is Chigusa Nagayo’s promotion. Marvelous doesn’t have a TV deal so we don’t get to see Rin too often, I have no idea how she has been progressing but we are about to find out. Tsukasa on the other hand is the opposite of Rin, as she is the Ace of Ice Ribbon and has had 20 championship reigns in her career. Still, Tsukasa is not a selfish veteran and I imagine she will give Rin plenty of opportunity to show what she can do. Rin jumps Tsukasa before the bell starts and dropkicks her, she tries a few quick pins but Tsukasa kicks out each time. Tsukasa gets her robe off and throws it at Rin, snapmare by Tsukasa and she kicks Rin in the back. Scoop slam by Tsukasa and she kicks Rin in the back, she puts Rin in the ropes and dropkicks Rin in the back for a two count. Rin comes back with a few dropkicks of her own, Tsukasa returns to her feet and elbows Rin, but Rin elbows her hard to the mat. Scoop slam by Rin, she goes up top but Tsukasa tosses her off. Tsukasa then goes up top but Rin returns the favor and throws her off as well, Rin gets on the turnbuckle but again she is tossed to the mat. It happens again to Tsukasa, Rin goes off the ropes but Tsukasa hits a drop toehold and applies a crab hold. Rin gets to the ropes to break the hold, Tsukasa puts Rin in the corner and she nails Rin with a dropkick. Scoop slam by Tsukasa and she kicks Rin repeatedly in the back, but Rin ducks the PK and rolls up Tsukasa for two. Rin tries a few more flash pins but Tsukasa regains the advantage and applies a crossface. She reverts it to a cross-arm submission, but Rin wiggles to the ropes and forces the break. Tsukasa gets Rin on her shoulders but Rin gets out of it with a victory roll for two. Hurricanrana by Rin, but Tsukasa rolls through it and they trade quick pins. Enzuigiri by Tsukasa and she hits the PK, she goes up top and drops Rin with a missile dropkick. Tsukasa gets Rin on her shoulders again and this time she delivers the Japanese Ocean Cyclone Suplex Hold, and she gets the three count! Tsukasa Fujimoto is the winner. Business has picked back up, as WAVE is mixing in a variety of match types on this card to keep the action fresh. Both of these wrestlers are established veterans with a good amount of success in their careers. Ohata is a ten year veteran of Pro Wrestling WAVE, she mostly has had tag championship success in her career and comes into the match with the International Ribbon Tag Team Championship. 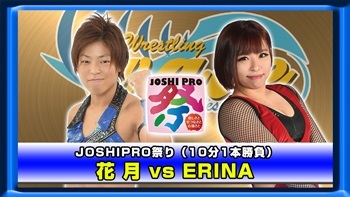 Yoshiko wrestles out of SEAdLINNNG, where she is rebuilding her career after leaving Stardom in 2015. They stare each other down to start, Yoshiko pushes Ohata into the ropes and she gives a clean break. Yoshiko kneels in a taunting way but Ohata dropkicks her and kicks Yoshiko into the ropes, she charges Yoshiko but Yoshiko ducks the crossbody attempt. Yoshiko avoids another crossbody and hits a hard shoulderblock, facewashes by Yoshiko in the corner and she hits a running boot. Yoshiko goes for an Irish whip by Ohata reverses it, she kicks Yoshiko back and hits a crossbody off the second turnbuckle. Ohata mocks Yoshiko’s pose and goes for another crossbody, Yoshiko catches her but Ohata hits a DDT and kicks Yoshiko out of the ring. Baseball slide by Ohata, she goes out after Yoshiko but Yoshiko hits her with a chair. Yoshiko gets up on the apron and jumps down onto Ohata with a seated senton, she gets on the apron to pose but Ohata throws a chair at her. Ohata gets on the top turnbuckle and hits a missile dropkick, cover by Ohata but it gets two. Ohata picks up Yoshiko but Yoshiko hits a strike combination, running boot to the head by Yoshiko but Ohata kicks out of the cover. Yoshiko Irish whips Ohata and hits a tilt-a-whirl backbreaker, she applies a stretch hold before hitting a pump-handle slam for two. Yoshiko picks up Ohata but Ohata slides away and hits a Stunner, she knocks Yoshiko against the ropes and hits a low crossbody for a two count cover. Ohata goes up top and hits a diving body press, but that gets a two as well. Ohata goes for a suplex but Yoshiko blocks it, hard elbow by Yoshiko but Ohata elbows her back. Rolling Germans by Ohata and she holds the last one for a two count, she goes off the ropes but Yoshiko catches her with a chokebomb. Yoshiko picks up Ohata and sits down on her, sliding lariat by Yoshiko and she covers Ohata for two. Fireman’s Carry Slam by Yoshiko, she goes to the second turnbuckle but Ohata avoids the diving senton. Both wrestlers are slow to get up, Ohata applies a few quick pins but Yoshiko kicks out of each one. Ohata goes off the ropes but Yoshiko levels her with a lariat, Yoshiko picks up Ohata and gets her on her shoulders but Ohata hits a crucifix slam. Ohata goes for the Blue Dahlia but Yoshiko gets out of it and hits a lariat, sliding lariat by Yoshiko but Ohata reverses the cover to a two count of her own. Ohata is up first, but the bell rings as the time expires. The match is a Draw. Poor Natsu Sumire. Takumi Iroha started in Stardom but left the promotion in 2015 to join up with Chigusa Nagayo. Since then, she has gotten a bit of a mean streak and has been really well protected in promotions she visits, which shows both her growth as a wrestler and the respect given to Nagayo’s primary trainee. Since she mostly wrestles in Marvelous she is still pretty under the radar, but has several notable wins recently, including over Cassandra Miyagi, Konami, and Ryo Mizunami. Natsu Sumire is in her third year but hasn’t had a lot of luck in WAVE, she hasn’t shown the growth one would hope for and is likely never going to progress beyond the midcard. So this match is more a showcase for Iroha, which I assume she’ll take full advantage of. Natsu is the MC for this event anyway so she talks to Takumi before the match, but she talks too long and gets kicked in the head. More kicks by Takumi and she throws Natsu out of the ring, she goes out after her but Natsu throws Iroha to the ground. Natsu goes up top and dives out onto Takumi with a splash plancha, she gets off her shirt and chokes Takumi with it. Takumi gets out of it and they trade elbows, Natsu throws Takumi back into the ring and she kicks Takumi against the ropes. Bronco Buster by Natsu in the corner and she goes for diving crossbody, but Takumi ducks it. Takumi picks up Natsu but Natsu gets away, hard elbow by Takumi and she nails the Running Three for the three count pinfall! Takumi Iroha is the winner. This wasn’t long enough to get excited about (less than four minutes), but they packed a lot in with the time they had. Takumi continued to show her “no nonsense” attitude, and while the ending was a bit sudden it put over how much she has grown in the last year. To her credit, Natsu mostly wrestled it straight (not counting the Bronco Buster) and tried her best to keep up, but it was mostly the Takumi Show. More a storyline match as Ryo Mizunami came out afterwards to jaw with Takumi, but not a bad watch. After a long show, we have reached the main event of the evening. These two probably don’t need an introduction, but Chihiro is the young star of Sendai Girls’ and already has held the Sendai Girls’ World Championship, including a big win over Meiko Satomura. Rina is one of Pro Wrestling WAVE’s top young talents, she is in her third year and while she doesn’t have the title success of Chihiro, she is very protected wherever she wrestles and has shown a lot of talent. Chihiro is slightly higher on the Joshi Totem Pole but Rina isn’t too far behind, so this should be a pretty even match. They start with a battle of strength with neither getting a clear victory, Chihiro takes Rina to the mat and goes for Rina’s arm but Rina gets out of it and they return to their feet. Headlock by Rina but Chihiro gets out of it and they trade shoulderblocks until Chihiro sends Rina to the mat. Hip attacks by Chihiro, and she covers Rina for two. Chihiro picks up Rina but Rina fires off her own hard shoulderblock, Rina applies a Scorpion Deathlock but Chihiro gets to the ropes for a break. Back up, knee by Rina but Chihiro picks her up and slams Rina into the corner. Body avalanche by Chihiro, she picks up Rina and hits a scoop slam. Chihiro goes for a rolling senton but Rina rolls out of the way and applies a sleeper. Chihiro gets out of it with a judo throw and goes for a cross armbreaker, but Rina gets a foot on the ropes. Chihiro slams Rina in front of the corner and hits a somersault senton off the second turnbuckle, she picks up Rina but Rina pushes her off and they trade elbows. Rina goes for the sleeper but Chihiro elbows her away and they both hit lariats on each other with neither going down. Rina hits a bunch of short range lariats, she goes off the ropes but Chihiro sends her to the mat with her own lariat for a two count. Chihiro goes for a suplex but Rina blocks it and hits a Stunner, kick by Rina and she hits a backdrop suplex for two. Rina picks up Chihiro but Chihiro lariats her, she picks up Rina but Rina lariats her back for another two count. Rina hits another lariat but again Chihiro gets a shoulder up on the cover, Rina goes off the ropes but Chihiro nails a spear. Before she can fully capitalize, the bell rings as the time has expired. The match is a Draw. This was a very unique card by Pro Wrestling WAVE and I think they really delivered. The ten minute time limit was necessary due to the number of matches, and for the most part it didn’t hurt the action as the majority of the matches were sprints. None of the matches on the show were actively bad, several are quite skippable but that tends to happen on ten match cards. But several other matches were really great and from top to bottom it was a very complete show. An easy recommendation, I enjoyed the fresh match-ups and they squeezed a lot of action into a two hour show.